And some of the houses around here are enormous... 15+ rooms. That's just too big. There's no chance that any single family could ever afford it without being independently wealthy, and I'm not going to worry about affordable housing for the wealthy. Completely agreed this is where the focus should be. Conversion of these into apartments produces nice affordable units. A 3FR into a 6 apartments would be great. On a side note, I've noticed many Allston/Brighton addresses that are 2 or 3 family (per the city assessing records) have only 2 people living in them. Obviously not going to advocate kicking them out from the house they own, but it seems a shame when we have so much overcrowding in nearby houses. Flats on D is not exactly marketed as affordable. What makes you think that only 2 people are living in them? The Boston Housing Authority (BHA) is seeking to accommodate the city’s growing need for affordable housing for its seniors, officials say, as they prepare to file a proposal with US Department of Housing and Urban Development (HUD) that would up its ratio to 80 percent elderly and 20 percent non-elderly disabled residents in sanctioned elderly-disabled housing developments. “We’re hopeful that HUD will approve our new designated housing plan – the 80 percent-20 percent split [up from 70-30] will better meet the growing need for affordable housing for Boston’s seniors,” said Bill McGonagle, interim administrator at the BHA, in a statement. Under the proposal, the shift would happen gradually as non-elderly disabled residents move out of 329 current units. The BHA will also make 330 vouchers available for non-elderly disabled public housing applicants who otherwise would not have received unit offers, according to the proposal. Right? I wonder why they're all empty? When two bedrooms are going for $4,000+ in the city, it's not a stretch of imagination. My point was, no one who wants/needs a three-bedroom apartment can afford what's being built. So, the city can say that they should be built, but unless they are outside of downtown or unless they are income-restricted, there's no sense building them. Didn't want to name names due to the drama, but someone just called out one prominent Aberdeen/Cleveland Circle activist who bought a 3 family home and converted it into space for just herself and her husband. I didn't want to name her when you asked that is just bringing stupid drama over here. Any large commercial / industrial developer is required to pay into the city's "linkage" fund. That money is used to pay for affordable housing and job training programs. The linkage "fee" (tax, really) is applied to commercial and industrial projects. Developers building large residential projects pay into a different fund with different requirements. Several dozen community activists are urging Mayor Martin J. Walsh to take advantage of the construction boom sweeping Boston by raising fees on developers to pay for affordable housing and job training initiatives. At a meeting with city officials Wednesday, advocates representing a coalition of more than 30 housing and worker training organizations argued that soaring rents are driving low- and middle-income residents out of the city. They say higher fees will help Walsh fulfill one of his top priorities, increasing funding for affordable housing by $20 million a year and building 53,000 residential units by 2030. And, with the Boston real estate market booming, they argue that developers can afford to pay more. “In Boston, we’re blessed with a strong market, but that strong market is also creating challenges for residents in the form of high rents,” said Joseph Kriesberg, executive director of the Massachusetts Association of Community Development Corporations. He and others are calling for a 40-plus percent hike in the so-called “linkage” fees that developers of most large commercial and institutional projects pay to city funds that underwrite affordable housing construction and job-training projects. The current fee is $8.34 for each square foot above 100,000 for affordable housing, and $1.67 for jobs programs. A 350,000-square-foot commercial development would be assessed $2,085,000 for the housing fee, for example, after excluding the first 100,000 square feet; the payments would be made over seven years. Advocates want to raise the housing fee to $12 per square foot and the jobs assessment to $2.40. The Walsh administration said it is open to raising those fees and has drafted a proposal. But city officials declined to release specifics, and in a statement the mayor struck a cautious tone. “We’re exploring many options, and linkage is one of the resources we have in our toolbox. Any changes to linkage need to be carefully analyzed and balanced with its impact on commercial growth,” Walsh said. I'm linking to this article because I thought it connected well to the topic of this thread, I thought the author made some good points, and because I thought some of you would find it interesting. I don't have a subscription to The Economist so it doesn't appear this is behind a paywall, hopefully you guys can access it. I was able to access it. Good read. A nice, concise summary of the problem and a couple of answers. 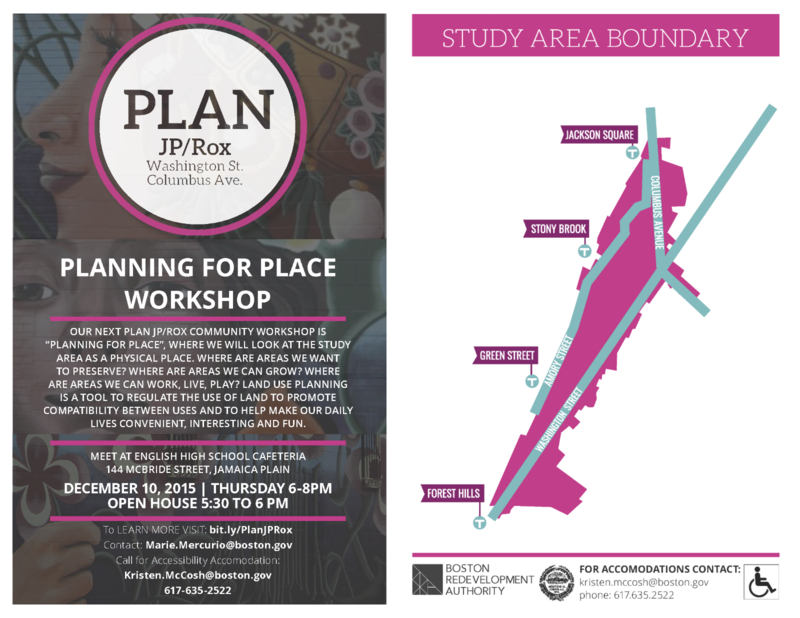 Planning for Place Workshop in JP tonight. I'm planning to attend--let me know if any of you plan to be there. It's funny, CityLab had a similar article recently. Slightly different take though. TL;DR: the research leans towards inclusionary zoning not significantly increasing development costs (which I think a lot of people, even proponents, would assume), but also not being that successful at generating units. Local note: Boston might be the one outlier. City Observatory is a think tank that publishes careful, quantitative analysis of urban problems. CityLab is pop-journalism by the hackiest neo-urban thinker of them all, Richard Florida. I like the idea of the program a lot, but don't like the mix of housing they are building. Building only three family homes instead of a mix of one and two families would have done more to create affordable housing while still being contextual. Most of the neighborhoods with vacant lots have plenty of triple deckers and other slightly larger forms mixed in, such as two family homes with an additional 1br apartment in the top. Too much density for the neighborhoods if you build 'soaring' triple deckers. This city should be building a minimum of 70~80,000 units by 2030. As a functioning political entity, the sum total of City government still ain't serious about putting Boston on a track to solving the abysmal housing situation anytime soon. The focus of this Globe article is on accessory apartments and Newton, but I want to throw a spotlight on the another aspect. I occasionally anger older people at meetings by basically suggesting they should sell their homes and move into a smaller place. An 84 and 94 year old with a 10-room house that they've now reduced to 8 rooms for themselves. When people talk of a lack of housing for young families, some of that missing housing is being taken up by empty nesters. The front end of the Baby Boomers are entering their 70's. Over the next two decades, an increasing percentage of family housing will be taken up by elderly empty nesters. Firstly, this makes it so they don't feel the impact of real estate taxes in the tight market they are helping to create. Demand for family housing is high, they should be pushed to put it on the market. Secondly, only 41C allows you to move, the other 2 require you to have lived in that property for the last 5 years. If you try to downsize and suddenly you have to start paying real estate taxes at your new place. So, the better option is to just sit in place until you die. I realize there are sentimental aspects to staying in your home, but it is frequently a safety risk and is compounding our housing issues. Let's end these policies that encourage/allow them to stay in place. This is an issue with a lot of moving parts, and one that isn't necessarily going to just anger older people. What of family-occupied multi-family homes? I have three elderly siblings across the street who own and occupy a three-decker -- shall we pack them off to assisted living? Reading the desires of people who wish to remain in their homes as "sentimental" is a stunningly simplistic interpretation of a complex socio-economic system. Using a system of taxation to modify the way that the elderly conduct their lives is a concept that I've some difficulty getting my mind around. It has the odor of oppression. Last edited by Beton Brut; 12-02-2016 at 04:43 PM.